Its been more than a year since I stopped tracking my expenses on a daily basis. When I first started out my financial journey, I wanted to find out how much I was spending on each specific item so that I can streamline it accordingly. However, after a few years doing that, it became quite pointless and it also restricted my life too much as when I spent a little more for any day, I would feel the pinch. So, I decided to gave it up and just keep track once a month instead. Unfortunately, I lost some of my expenses data in 2016 as I accidentally deleted the sheet in my excel file. Looking at the other months, there were some months which I over spend especially for this year. The green bars shows my basic monthly income from my full time job while the blue line shows my monthly expenses. The income bars become very irregular as the income from other sources are unpredictable, sometimes more while sometimes less. It is also because of the other sources of income that I can still have some substantial savings despite the increased expenses. 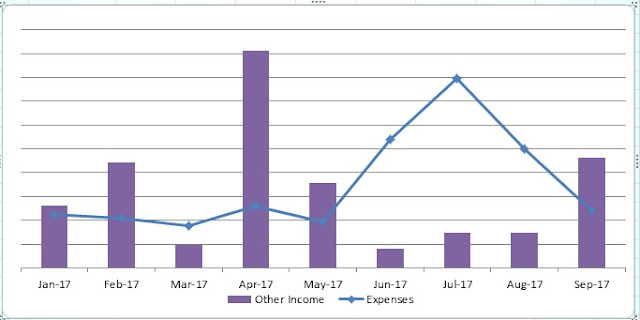 In fact, other sources of income this year so far has been able to cover all my expenses which means I could save 100% of my full time job income. It took many years of hard work and opportunities seeking to get other sources of income which is a goal I embarked on many years back to create multiple sources of income after getting inspired by a book I read. To create more income, one thing I learnt is that we must find something which we have the passion for. I have the passion for finance, investments and housing and property so I went into mortgage consultancy. After 2 years of doing it, I still feel passionate whenever I can advise someone on their affordability for a new property they are intending to buy or I can help someone save some money through refinancing their loans. It also helps that I do the consultancy service without relying on the income for survival. I can give advise without expecting to earn from it. Blogging is also a passion. Writing on finance and investments is what I like to do. This blog has existed for 4 years plus now and I can't believe how I can still manage to write. To me, this is like a journal as well as a platform where I hope to reach out to more people on the importance of financial planning. This was the purpose which gave birth to this blog and it has been an amazing journey where I got to know some friends along the way and receive heartwarming emails from readers like yourself. Hope this post is an inspiration on what you can do for your future too. 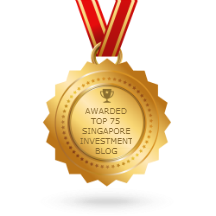 There seems to be competition among the banks in Singapore which is good for consumers as they start to give more interests and benefits to get more customers. Previously, many cashback cards were launched with no minimum spend and no other conditions. You get cashback for any spending. This card seems to offer the highest cashback of 2% for all online spend and also all contactless and mobile payments. Its easy to find contactless payments now all around Singapore which shouldn't be hard to get the 2% cashback. Just use visa pay wave easily at many locations island wide. If you're interested, apply from now till 15 November to get $150 Grab Gift for use for your Grab car rides. This is for new SCB cardholders only and not eligible for any other promotions from the bank. Apply here today to get your $150 Grab Gift and get your cashback started! This year, I've been seeing more news on the gig economy. 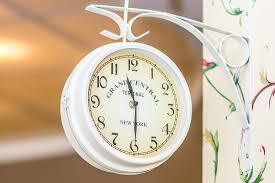 Think of flexible working hours, doing what you love, be your own boss and freelancing. These are all part of the gig economy. In Singapore, about 9% of the workforce here are in the gig economy. That is still not a lot as compared to countries like the US having 30% of their workforce in the gig economy. Interestingly, an article on the Straits Times said that "about 47 per cent of Institute of Technical Education, 35 per cent of polytechnic and 10 per cent of university graduates went into part-time, temporary or freelance jobs last year - more than double the share from a decade ago." More and more young people choose to have freedom in their work instead of going into full time work in the corporate world. More often than not, we hear people saying things like Monday blues, cant's wait for weekend to come, tired of working or I hate my boss. All these are signs that a majority of people don't really like their job but still have to work in order to survive. This is a stark contrast compared to those in the gig economy where a great majority enjoyed their work as freelancers. I'm not suggesting that you quit your job right away and go straight into the gig economy as its still a risk to forego your stable monthly income. However, there are some ways the gig economy can benefit us to reach financial independence earlier so we do not have to work for the sake of working anymore. Does this sounds good to you? How The Gig Economy Can Benefit Us? The gig economy is getting larger and more connected now that it is easily accessible to most of us or in fact all of us. In Singapore, it is estimated that about 1.5% of the workforce are 'secondary' freelancers, meaning these workers freelance part-time alongside other jobs and would include students, housewives or retirees who take on side jobs for additional income. When I was in town for work, I often see many students riding on their bicycle or e-scooters with a big bag. The names on these bags are familiar, Uber Eats, Deliveroo, Food panda are some of the most common ones I've seen. All these are young students earning some extra pocket money. I also recently saw some advertisements on a crowd sourced tuition portal called Tueetor. There, you can be matched to any students who are looking for tuition that matches your skills. You can earn some extra money by teaching others. I've not tried it before but it does looks good. There are so many requests on the website which we can see from the map. Its like the Uber and Grab of Tuition. I suppose the gig economy will continue to be more popular as people become more aware and savvy on how to take advantage of it to increase their income. This is like a dream come true for those who always wanted to build multiple sources of income. I personally already have a few friends who are in the gig economy. They can potentially earn double of what the average person of their age are earning. However, as mentioned earlier, it can be risky to quit your job and go straight into the gig economy, though we can start on the sideline first and see how it turns out. If you can offer value, people will be willing to pay for your services. We can also accelerate our goal towards financial independence through the gig economy. With higher income, it makes it easier to achieve our financial goals and one day we'll realise we have got out of the rat race. Rather than working in a job which we hate for the rest of our lives, we can make some plans to have more freedom and happiness in our life. *If you're interested to create your own financial plan, do check out this article which I've written previously. Also, check out how you can retire in 7 years in this article. Money Hacks is a 2 part series to share about the deals which I used to make the best out of my money. Read Part 1 here. In Part 1, I shared on the high interest bank accounts, the cashback cards and also the dining discounts which I can get. In part 2, I will write about the deals for movies, shopping and also how to travel smartly. What's more, you can use my link to get $10 free when you sign up. Sign up here to get your free instant cashback. Many of you should have heard of Carousell where you can buy and sell stuff. Its getting so popular that I'm hearing more and more people use it. Besides selling your stuff, many people actually buy things from there too. You can get some good stuff just searching around and most of the time its much cheaper than what you get in the retail shops. 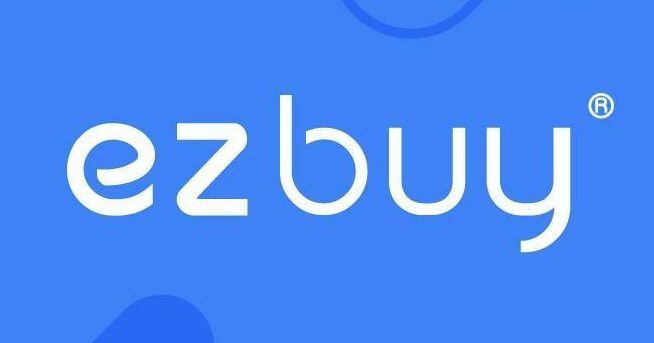 Ezbuy is an online shopping portal which brings you the stuff from Taobao without you having to buy your stuff in RMB. There are quite a lot of stuff available for sale and its fairly easy to use. For delivery, you can choose either to deliver straight to your doorstep or choose a location near your house. This can save you quite a lot of delivery charges. For travelling, the 2 biggest expenses will be the air tickets and accommodation. Let's talk about air tickets first. For comparison of the best air tickets, you can use skyscanner which will instantly compare for you the cheapest air tickets across many airlines. In just less than a minute, you can get the best deal for your flight tickets instantly. However, air lines do not offer promotions all the time so its crucial to know when the promotions are offered. There are a few ways to keep up to date on the promotions. Firstly, you can follow the different airlines on their Facebook page and also subscribe to their newsletter. For Scoot, they seem to offer special rates on Tuesday and for Jetstar, its on Friday. Full fledge airlines such as Singapore airlines do offer promotions too and it can be quite attractive once they have it. Another website to follow is moneydigest.sg which always have the latest deals updated on their site. For accommodation, there are more choices now as compared to the past. 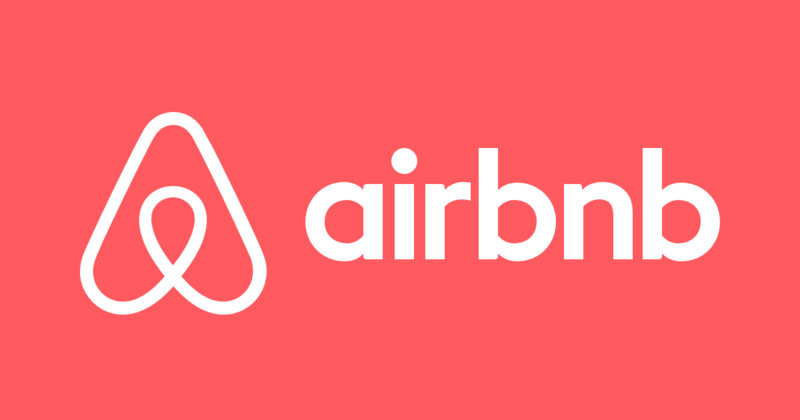 Besides staying in the traditional hotels, there is airbnb where you can stay at someone's else home. If you're going on a trip with your family, you can actually book the whole apartment with kitchen, living room, bedrooms all for yourself. I've stayed in a few before and its quite an unique and fuss free experience. Just remember to check the reviews to make sure its good before booking. For hotels, we can use trivago.sg to compare for the best hotels. You might have used Agoda or booking.com before but now with Trivago, they instantly compare against many websites (including agoda and booking.com) for the best hotel deals. Its the best "skyscanner" for hotels. Regardless if its getting higher interest on your bank account, cashback for spending, shopping, dining, watching movie or even travelling, there are money hacks which we can use to make the best out of it. With the power of technology and the rise of comparison portals and sites, it makes it easier to get the best deals now. P.S: I've started a comparison portal on my blog too to allow you to compare for the best deals. Check it out here. Money comes and go like a running tap water. However, we can always make the best out of our money by using a few simple hacks which I've done over the past few years. I believe this has significantly added to my savings and at the same time I still continue to enjoy the finer things in life. Let me share in detail what I do to make the best out of my money which you can too to make the best out of yours! Since 2005, I started putting my money into higher interest account because the banks in Singapore just slashed their interest rates like nobody's business. Since then, I've switched a few accounts here and there because interest rates in the accounts changes over the years too. For now, my 2 main high interest accounts are from OCBC and CIMB. OCBC 360 is easy to use and we just need to meet 2 criteria to enjoy 1.5% interest rates on the first $70,000 in the bank account. I just need to credit my salary and also pay 3 different bills to get the 1.5% interest rate. This is easily an additional free $1050 for the year. Above $70,000, I put into CIMB fast saver account to earn 1% interest on the first $50,000 and then CIMB star saver to earn 0.8% on any balance. The best is there is no conditions to meet for CIMB so its very straightforward. It is very easy to open too just need to do everything online without the trouble of going down to the bank. I started using cards to get cashback on my spending when I heard a friend say how he had a debit card which gives 2% cashback on all spending. I went to apply for it and used it to pay for my university fees where I got hundreds of dollars in cashback as a result. Nowadays, its hard to find a debit card which can give good cashback. One of the debit card which gives cashback is the DBS visa debit card which gives 5% cashback. However, you have to use visa paywave for your payments and have to keep withdrawals from the ATM at 3 times or lesser. For me, this is very hard to achieve. So, I signed up for some credit cards which gives good cashback for my spending. This is easily done for those who has a stable income. If you've started working or have been working for awhile now and do not have any problems controlling your spending, getting a credit card is more beneficial than not having one. 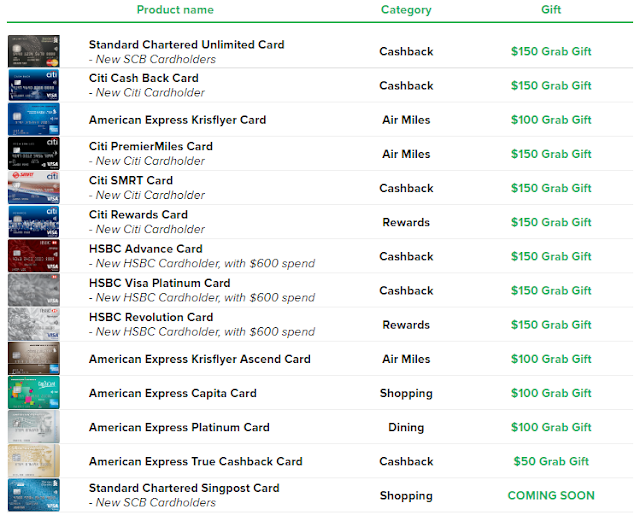 My favourite cashback credit cards is still the Standard Chartered Unlimited card and American Express True Cashback card. Both gives 1.5% cashback on ALL spending (online or offline) and 3% cashback for the first 3 months for the AMEX card. Getting credit cards has even more perks because often there is good sign up bonus. For example, I got $138 credited into my card when I signed up for the SCB unlimited card and additional $100 vouchers. There's also a new credit card that gives 2% cashback. 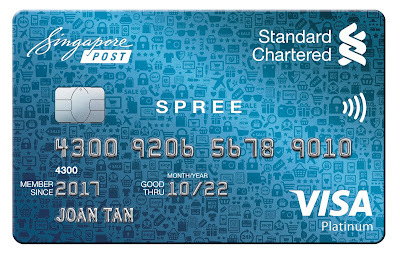 This is the Standard Chartered Spree credit card. There is no minimum spend and 2% cashback is given for all online and contactless payments. Currently, there is promotion to get $150 Grab gift for many of the credit cards below. Promo ends 15 Nov 2017. There are many deals I've found out over the years which is so good sometimes I don't believe its true. Fancy some 50% off for your dining? Special discounts for movie tickets? Or half price for your shopping? All these are possible with just a touch of your fingers. Most deals are found online now. For dining, some of the best websites to make reservations is Chope and Eatigo. For Chope, they give 100 Chope dollars for very reservation made. Just 400 Chope dollars and we can exchange for a $10 restaurant voucher. That's $10 off for every 4 reservations only. The best is still Eatigo which is a dining reservation app that gives up to 50% off your total bill for the restaurant you book at. 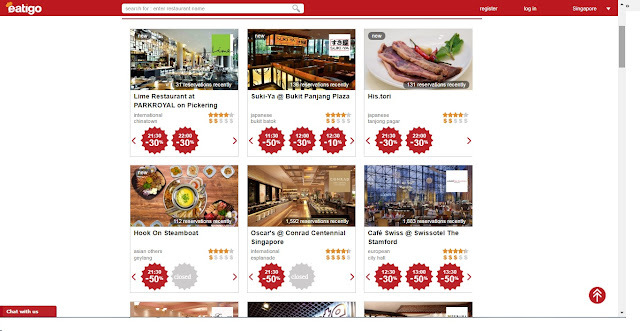 You can get 50% off for a buffet at Swissotel The Stamford or fancy 50% off for some Michelin star restaurant at Marina Bay Sands? All these can be done using Eatigo to book your reservation. There are many restaurants on the website which you can look through. Many people are paying the full price for their dining but you can enjoy the same meal for just half the price at the same restaurant. That's the smart way of dining. There you go, 3 simple money hacks you can start to make the best out of your money. Part 2 will go more detail into money hacks for movies, shopping and travelling. Stay Tune!